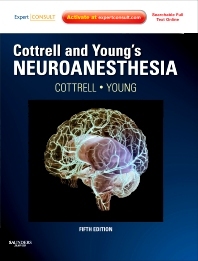 Cottrell's Neuroanesthesia 5th Edition, edited by James E. Cottrell, MD, FRCA and William L. Young, MD, delivers the complete and authoritative guidance you need to ensure optimal perioperative safety for neurosurgical patients. Integrating current scientific principles with the newest clinical applications, it not only explains what to do under any set of circumstances but also why to do it and how to avoid complications. Comprehensive updates reflect all of the latest developments in neurosurgical anesthesia, and contributions from many new experts provide fresh insights into overcoming tough clinical challenges. Access to the complete contents online at expertconsult.com enables you to rapidly and conveniently consult the book from any computer. New co-editor William L. Young, MD joins James E. Cottrell, MD, FRCA at the book's editorial helm, providing additional, complementary expertise and further enhancing the book's authority. New chapters keep you current on interventional neuroradiology, anesthetic management of patients with arteriovenous malformations and aneurysms, awake craniotomy, epilepsy, minimally invasive and robotic surgery, and pregnancy and neurologic disease. Access to the complete contents online at expertconsult.com enables you to rapidly and conveniently consult the book from any computer and follow links to Medline abstracts for the bibliographical references.